Notes: Several soundtracks of the film exist: one performed by Shinkai and his wife, one performed by professional Japanese actors, and one English dub. This review is based on the second, though the voice acting has relatively little to do with my opinion. In Earth's near future, an enigmatic alien race has attacked a settlement on Mars, inciting humans to take up arms. In the midst of this, middle-schoolers Mikako and Noburu are still content to enjoy their lives and possibly a budding relationship as well, but their life together is cut short when Mikako is recruited as part of the counterattack and sent into space, creating a gap between them that soon begins to be more than mere spatial distance. My god, Makoto Shinkai draws his sunsets well. I think that calling him the new Miyazaki is premature, and thankfully he's humble enough to call that claim an "overestimation", but the man is just brilliant at drawing evocative landscapes. Using the perfect mix of bright light, wind-blown leaves, and restrained but colorful tones, he fills a simple cityscape with all of the nostalgia, sorrow, and loneliness in the world, and having seen my share of lonely landscapes, I can say that no-one captures those emotions in animation as well as he does. Voices of a Distant Star, a story of two lovers struggling to stay in contact as one of them travels to deep space, is one of the loneliest movies I've yet seen, and these paintings do a very good job of amplifying the isolation that its dialogue and imagery speak of. In the film's haunting opening scene, for example, Mikako searches for life in an eerily abandoned city while simultaneously reflecting on the places that human thought can travel to. Later, while drifting through space as part of a solitary fleet of ships in an empty solar system, she ruefully asks "what if the solar system isn't meant for humans?" while gazing at Mars and seeing its deserted colonies. And in a particularly sorrowful moment, she deliberates on the intangible differences that always set one's home apart from any other place, even a place that is the same in almost every regard. I think that the film's greatest strength is the degree to which it can capture the emotional resonance of moments like this, and it does a wonderful job of imparting that resonance to the viewer. Voices of a Distant Star almost never falters on a technical scale, and I have to give Mr. Shinkai a lot of credit for producing such a solid result with so little help. His beautifully detailed cityscapes, starscapes, and windswept alien plains are utterly astounding, and while the animation doesn't quite compare, it flows well throughout and delivers both simple shots (a couple riding on a bike) and elaborate sequences (ships fighting against a horde of tentacled aliens) with skill and care. The voice acting is good, and the music, composed and performed by Shinkai's friend Tenmon, does a beautiful job of complementing the atmosphere. On another note, while few reviewers have recommended the movie on the basis of its science-fiction elements, I personally enjoyed them quite a bit. We don't learn much about the Tarsians, but we do get a good look at their fascinatingly strange designs and an especially chilling moment where Mikako gets a closer-than-average encounter. The on-screen descriptions of Jupiter are the kind I would like to read should a tourists's guide to the solar system ever be written, and Agartha, the film's beautiful fictional extrasolar planet, is a place I definitely wouldn't mind visiting. I have to say that I was consistently as interested in the story of the Tarsians as the story of Noboru and Mikako, which is a vast improvement on the many shows and films that use their settings as inconsequential gimmicks. That said, I do think that Shinkai has a long way to go before he can be called a "master" filmmaker. 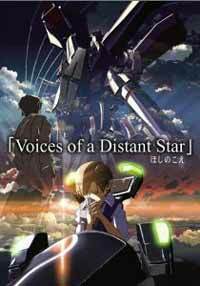 Voices of a Distant Star does many things very well, but it makes the mistake of putting more weight on ideas and storyline than on the characters themselves, and this significantly lessens its impact. Instead of habituating us to Noboru and Mikako and earning the right to tug at our heartstrings, it spends less than ten minutes on them before it pulls them apart and demands that we feel their pain: we just don't have enough time to see how their relationship came about, and what little we do find out comes from secondary references. While I empathized with them, I would have felt more strongly had they been better fleshed-out, and the fact that I've yet to meet a single 15-year-old kid who is as committed to a relationship as these two were made the story much, much less believable as well. On top of this, there are a few parts of the film that just don't make that much logical sense. I'll admit that the fact that Mikako wears a schoolgirl outfit while piloting a ship frustrates me more than it upends the plot, but the film only briefly and tangentially explains why she was ever sent into space at all, and I think that following the principle of showing rather than telling would have greatly strengthened that part of the story. There are also some details that never get explained, including the fact that we see houses built into a cliff when we reach Agharta but learn neither who lives in them nor why they are built there in the first place. While I appreciated the absence of filler, I think that adding ten or fifteen more minutes would have better let us appreciate the setting, and with only a half hour to tell its entire story, the film feels constrained. As I said, Makoto Shinkai made an excellent start with Voices of a Distant Star, and I enjoyed it in spite of my quibbles. I would have liked it more had it made the extra effort to endear its characters to us, but in the end, the story is a quietly stirring one that works very well, especially when it is coupled with Shinkai's masterful artwork. Having seen his later effort The Place Promised in Our Early Days, I think he's made a lot of improvements with his subsequent work, and I have high hopes for him. Ultimately, my complaints will probably turn out to be inconsequential, and in spite of my problems with this film, I have a good deal of respect for it and its maker.